The lateral flow immunoassay (LFIA) has emerged as a powerful tool for rapid screening owing to its simplicity and flexibility for detection of various biomarkers. However, conventional LFIA strips have several disadvantages, including limits in quantitative analysis and low sensitivity. 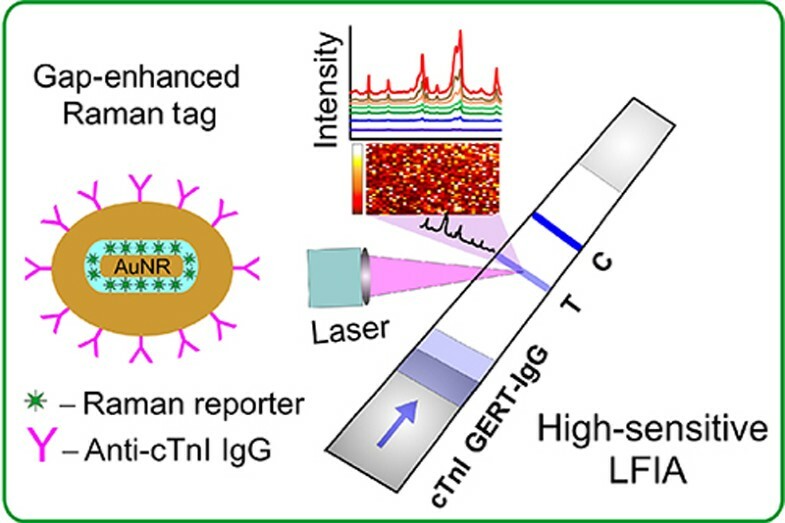 Here we developed a novel surface-enhanced Raman scattering LFIA based on nonspherical gap-enhanced Raman tags (GERTs), with Raman molecules (RMs) embedded in a 1-nm gap between Au nanorod core and Au shell. 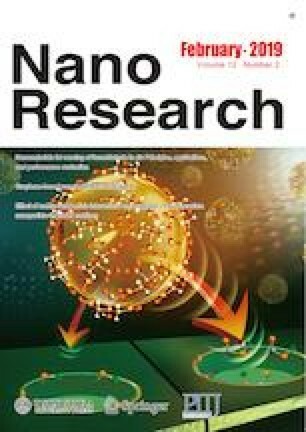 Such tags have a strong and uniform SERS response, an order of magnitude higher than that of other common SERS tags such as Au nanorods, nanostars, Au nanoshells with surface-adsorbed RMs, or spherical GERTs with embedded RMs. The feasibility of the tags was demonstrated by the semiquantitative and sensitive detection of the heart disease biomarker cardiac troponin I (cTnI). GERTs were conjugated with monoclonal antibodies and used for LFIA in the same way as ordinary functionalized colloidal gold. The presence of the target antigen, cTnI, was identified by Raman microscopy mapping of the test zone. With the SERS-based LFIA, the limit of cTnI detection was about 0.1 ng/mL. This value is within the diagnostic range of cTnI in the blood serum of patients with heart infarction and is 30 times lower than that of the colorimetric LFIA test using the same antibodies and either GERTs or colloidal gold as labels. Supplementary material is available for this article at https://doi.org/10.1007/s12274-018-2232-4 and is accessible for authorized users. The work on the synthesis and characterization of GERTs and on the development of SERS-based LFIA was supported by the Russian Scientific Foundation (No. 18-14-00016). Synthesis of labeled antibodies and studies of immune interactions in LFIA systems were supported by the Russian Foundation for Basic Research (No. 18-08-01397). BNK was supported by program No. 32 of the Presidium of the Russian Academy of Sciences (“Nanostructures: physics, chemistry, biology and basic techniques”). We thank D. N. Tychinin for his help in the preparation of the manuscript.